Almost half a century since unarmed civilians were gunned down in Northern Ireland by British soldiers, one veteran will now be charged with murder. Family members of those killed on Bloody Sunday said it was “vindication of our decades-long campaign to clear the names of our loved ones”. Prosecutors made the decision after a long-running investigation into the Bloody Sunday killings of 1972 in the city of Derry, also known as Londonderry. It became known as one of the worst atrocities during The Troubles — Northern Ireland’s three decades of civil unrest. Thirteen people were killed on the day also known as the Bogside Massacre — 14 others were wounded, and another person later died of his injuries. An investigation by the Northern Ireland Public Prosecution Service said there was enough evidence to prosecute one solider. A former member of the British Parachute Regiment, known only as Soldier F, will be charged with two counts of murder and four counts of attempted murder. Relatives who read a statement together in front of hundreds gathered in Derry said former soldiers accused of crimes “should face the due process of the law”. 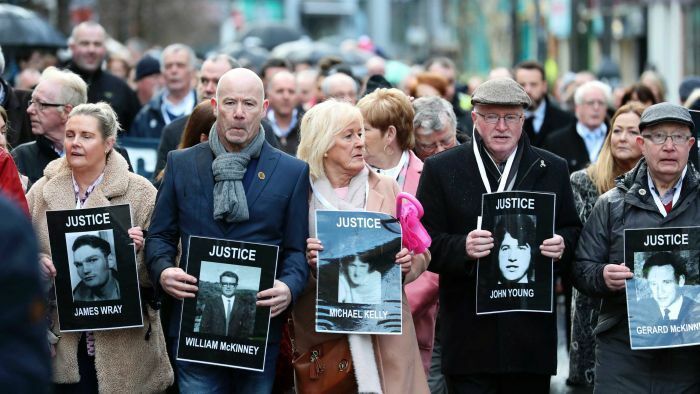 “We have walked the long journey since our fathers and brothers were brutally slaughtered on the streets of Derry,” the families said in a statement. British Defence Secretary Gavin Williamson said the UK Government would fund all of the former soldier’s legal bills. “We are indebted to those soldiers who served with courage and distinction to bring peace to Northern Ireland,” he said. Soldier F allegedly shot dead 22-year-old James Wray as people ran for cover during the chaos on Bloody Sunday. An inquiry by former Supreme Court justice Lord Mark Saville found Mr Wray was shot in the back twice and the second shot was probably fired as he lay injured in the street. Lord Saville concluded there was “no possible justification” for his death. Mr Wray’s brother, Liam Wray, told the BBC he was “relieved” over news of the prosecution, and said his family had been “fighting for 47 years”. The murder charges also relate to the death of 27-year-old William McKinney, who had gone to the march to film protesters with a new camera he had received as a Christmas present. He was shot as he ran for cover. The prosecution service said there was insufficient evidence to charge other soldiers. A 5,000-page report released in 2010 by Lord Saville found those killed on Bloody Sunday posed no threat, were unarmed, and that soldiers had fired the first shot. Former British Prime Minister David Cameron issued an apology and said the soldiers’ conduct was “unjustified and unjustifiable”. Mr Williamson said the United Kingdom Government would look at “new safeguards” to ensure defence force personnel “are not unfairly treated”. “Our serving and former personnel cannot live in constant fear of prosecution,” he said. In total, police reported 20 Bloody Sunday suspects to prosecutors — 18 of them former soldiers, one who has since died. More than 660 witness statements were taken and investigators gathered photos as well as video and audio evidence. Chief prosecutor Stephen Herron said there was a very strict test for prosecutions. “I wish to clearly state that where a decision has been reached not to prosecute, this is no way diminishes any finding by the Bloody Sunday Inquiry that those killed or injured were not posing a threat to any of the soldiers,” he said.